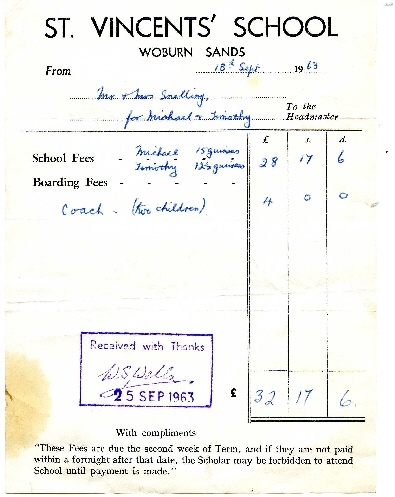 As a child, Tim Snelling attended the St Vincents’ School at the top of Aspley Hill, Woburn Sands (now flats), and then The Knoll School at the top of Aspley Heath, (also now flats). 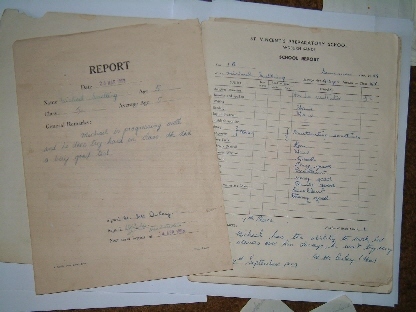 He has kindly written up his memories of his childhood, and provided many copies of images and documents he still has. From 1959 to 1972 I was living in Bletchley. My very first school in the area was St. Vincents in Woburn Sands [at the top of Aspley Hill] and my last was The Knoll before I moved on to the Kings School at Ely and beyond. Between St Vincents and The Knoll, I mostly schooled in Bletchley at Church Green Road and Holne Chase Primary and Infants schools. I still have a colour slide scan of me attired in my Knoll school uniform – the proverbial lamb to the slaughter! The school colours were of a dark blue and light blue striping around the neck of a grey jumper and around the top of grey socks; the tie was a light blue background with dark blue stripes. 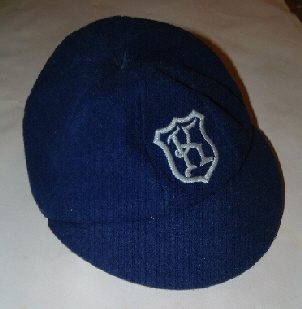 The cap, as seen, is blue with the ‘K’ motif. I don’t recall having a formal school blazer although when the cricket teams were photographed they all wore a blue blazer with ‘K’ motif on the breast pocket; and in the main the boys wore pale grey corduroy shorts, though this doesn’t seem to have been compulsory as I only ever seem to wear the dark grey linen short as seen here – mind you the corduroy would provide a slight added protection against The Cane! The photo was taken in our back garden at Warwick Road, Bletchley, either on the day we came back from Harrods where the uniform was purchased or on the day I actually went to The Knoll. I was at The Knoll from winter 1969 to summer 1972; I am there in the ‘1969’ school photo seen (2nd row down, third from right); this school photo was actually summer 1970. Only once during my time did we venture off to play ‘Romans and Gauls’ over in Dunstable Downs, it was considered a special summer treat and more often than not got cancelled due to some schoolboy misdemeanour that let the entire school down; such as the one I describe below. At the top of The Paddock there were huge bamboo clumps and rhododendrons. In the summer of 1971 someone had the bright idea of ‘inventing’ the bamboo javelin and using a rhododendron leaf as a flight. Soon it seemed the entire school was throwing javelins in impromptu competitions from the top to the bottom of the paddock at every break time. There was a sense of order to it that avoided any mishaps and fatal piercings and surprisingly we were un-supervised and allowed to continue this activity for quite some time – it certainly wouldn’t happen today. However, it all came to an end during the following sunny Winter term when a boy was injured – and then lied about how it had happened. Three boys had wandered off into the woodland beside The Paddock with their javelins; one of them then went off up a bank and for some inexplicable reason decided to throw his javelin. It ricocheted off tree branches and hit one of the other two lads in the face and pierced his right cheek. The boy, more shocked than feeling any pain, quick to realise what would happen when this came out, invented a story that he’d tripped and caught himself on a nearby broken sampling. The three boys all kept to the story for several weeks, however, like all things mischievous, the truth will out and came to the ears of the headmaster, Mr King; he called a school assembly and banned the javelin throwing for good, but by then it was too late to exact a disciplinary punishment on the chap who’d thrown the javelin, but I suspect that this may have been the reason the entire school were denied their 1972 ”Romans and Gauls’ summer trip to Dunstable Downs. And as for the Victim? – the hole healed with a simple butterfly plaster and to this day I bear a scare to remind me of that day – more of a dimple in my smile line really! Fortunately it did no lasting damage and I was a very, very, lucky chap indeed; an inch or two higher – doesn’t bear thinking about! The following term (Lent 1972) and the start of my last year, I’d clearly decided enough was enough as I took it upon myself to run away at the start of the first day back while everyone gathered for the first morning assembly after breakfast; I had some loose change in my pocket and I simply walked out the side door, up the long drive to the main road, down that long hill and then all the way to Bow Brickhill bus stop with a red phone box beside it where I awaited the bus, standing behind it out of sight; I got on and went back home to Bletchley. I even saw Mr Sutcliffe (deputy head) drive by – the search was afoot! I still wonder at how I ever got to walk all that way without being caught up with first. Perhaps only once or twice did I actually venture beyond the school bounds ‘unofficially’ (with the exception of my running off). Beyond The Paddock in the lower regions there was a tarmacked tennis court which even then had seen better days and beyond that a long meadow playing field on which the younger school boys played while the senior boys and school team played up on the top field. At the back of this long playfield there was a way out which connected to a small footpath that led down to the corner of the main road junction. From what I remember I didn’t actually know about this ‘way out’ until my last year or even last term. Us boys who had done our Common Entrance exams then had more time off and were allowed the privilege of swanning around while other boys continued class attendance. I guess if I had known about it before, I’d have probably run away via that route, being less conspicuous! There is mention on this page of the war memorial in The Spinney at the back: Oddly enough I don’t really recall it, but there is a vague sense of recollection of it, of some obelisk covered in green algae – probably thought it was some kind of ‘village cross’. However, there were two very large oak panels that hung on the south and west (?) walls of the large 3rd Form/School room on the far side (west) of the building: one of which was a memorial to The Knoll boys killed in WWI and/or WWII, the other I think was a listing of all the Head Boys that ever were. In the Spinney there was the remnants of an old car (one of Mr Kings cast-offs, I think) for the boys to play about in/on. By the time I was there it was pretty much abandoned even as a play thing! Though we spent a lot of time in the spinney constructing one wheeled racing carts and race tracks around and through the trees. A couple of brothers were into F1 and I think had some links with Silverstone – or aspired to! We also attempted the construction of tree houses and platforms with high-rise walkways from tree to tree. Incidentally, the pictures of inside The Knoll look pretty much as I recall it, the same wall paper and pictures hanging in the dining room; Mr King always sat at the head of the main table where the wall jutted into the room by the far door. When I first went there Mr. King had an old Labrador (in the 1970 school photo) called Alba which, if my memory serves, was Latin for ‘White’. Mr King was also our Latin master and though I didn’t care much for his authoritarian ways, he did actually get us well advanced in the subject. Suffice to say when I moved on to Public School, it all fell by the way, because I was quite literally being taken back to ‘Latin by Numbers’ using very childish text books. I suppose I should have been able to walk it, but at that age I was well ahead of the game and was not prepared to go backwards; I just lost complete interest in the subject – so much for the care and understanding of ‘advanced’ education of public schools! According to my Knoll reports, my French wasn’t too bad either – that also went adrift at Public School. Ah! the haunted tower lived on! I don’t remember it being a murder victim in my day. For us it was a lady in a white or grey flowing gown, said to be seen looking out across the paddock; I remember one night during my first summer term (1970), I could not sleep as I had been bitten all over by gnats earlier in the evening whilst watching some local lads dismantle something mechanical with engine oil everywhere. At night I got hot and itchy and so went into the tower room where the medicines were kept, in search of the calamine. I couldn’t find the light switch, but recall it being quite bright and moonlit. Remember I was only 10/11 years old then and I dared myself to go up to the next floor – and I did; it was indeed a scary experience of entering into the ‘twilight zone’, but of course no spectre appeared. I don’t recall any other boys venturing to the very top of the tower, not even in daylight! The tower loomed dominantly over the grandly stepped entrance into the large hall with a grand staircase. The ‘bomb shelter’ conjures up a vague memory and is probably near where I got struck by the flying javelin. There was also right over on the right hand side boundary of the wooded area (right of the paddock) a small brick tank built into the ground to ground level. It was full of wet and rotting vegetation, but never found out how deep it was. One day the school was visited by a very, very elderly old boy who talked to the whole school about his time there and the one bit I do remember him saying was about when he shinnied down the drainpipe one night on some dare-devil assignation and ended up having to hide in a water tank with a straw in his mouth – I can only assume that this was the tank to which he referred. As I recall, following down the footpath (to the right of the paddock) that took us to the top and bottom playing fields, just opposite where the footpath forked down the slope to the lower field there was a tumbled down old shack, rotting and full of large cobwebs. I think this had been a former gardener/caretakers’ shed. There were 5 classrooms. 2 junior ones in a small narrow timber built extension off to the left (East) beyond the boot room that was at the bottom of the concrete stairs. Two classrooms were over on the far side. The main large one, the third form (which was also the school assembly & common room – overlooking the side garden which had the added addition of a geodesic climbing frame while I was there) and the 5th form which accessed into the ‘gymnasium’ (at the rear) where we also had our dancing classes and performed plays etc. Carrying on round the corner of the inner courtyard (which was used for drying washing) led to the small passage way leading up to the chapel with a small room before that which was the morning medical room. Carry on further and there were the toilets and way out to the back and out to the science lab. In between these two classrooms was another set of toilet cubicles which were very old. The fourth form was up the concrete stairs, first room on the left on the first floor. A passage then led off up to the library & billiard room with one or two resident staff rooms en route and at the very end. Another passage led off to the right from this to where Mr King’s living area was (over the third form). This pattern was repeated on the second floor where the dormitories were and access to the tower and a small back stairs back down to Mr King’s residence. I think there were six dorms in all. All were named after famed Elizabethans. My first dorm was Drake which was the large room at the front (left of tower) and diagonally across the way was Raleigh (the wash rooms were opposite). There was another (junior) dorm above Mr King’s bit and another over by the tower entrance. The last two were situated off the concrete staircase (above fourth form) and at the end of the long passage (above the library room – which is the one in the website photo); I was in this last one too which, I think, was called More, but I can’t be sure. All that side (East) looked out over a side lawn on which we often played a net game called ‘Quoits’; it involved two persons or teams keeping a hand-held rubber ring in action over a badminton style net . Over on the West side passing the boys side garden there was small tarmaced court (adjacent to the gymnasium hall) which was used for playing ‘Padder’ – a kind of small version of Tennis using bats not much larger than Table Tennis bats. When not playing that it was used for Roller skating on – and it was where I mastered roller skating to a fine art of turns and twirls and all sorts. Pity I never kept it up or I’d have probably been a champion roller skater by now! Brothers at school were called Major (I), Minor (II) and Minimus (III) after their surname. A fourth would see the oldest called ‘Maximus’. As a brother moved on then the next oldest would go up in the rankings! There was a stand-alone property with an attached barn off to the rear by the footpath to the bridlepath. This was where we had our carpentry lessons with Mr Baynton; I think he (and family) also lived there; and he also taught us our art lessons. One of his end of lesson signing offs was to get a pupil to do a quick squiggle on the blackboard, he would then turn it into a drawing. In my last Lent term I actually won an art questionnaire prize – an oil painting of wild flowers by Mr B – I still have it. The day I left, it felt like a great weight had lifted off my mind, only for another weight impending as I moved up to public school, none of which I ever really wanted. I didn’t even look back as I was driven away at the end of my last term there; I cannot say my time at The Knoll was an entirely happy experience for me, but then my being sent away to school was all part and parcel of my life at that time. A few years later I stayed in Woburn Sands with my brother and his girlfriend/wife to be, at their flat in the old St. Vincent’s school house where ironically, my brother had boarded while I was brought forth into the world. We went up to the woods by The Knoll and went down the fenced footpath to the rear leading off to a wide bridle path into the woods; now thinking back on it, it did seem so quiet. Now I know why: It was the year Pink Floyd played at Knebworth which we all went to, so the year was 1975, and The Knoll was probably in a state of closure at that time and I never realised.